Global Voices were established  in 2005 at the meeting of bloggers at Harvard University as a community of people who believed  that in the age of the Internet «speech need no longer be controlled by those who own the means of publishing and distribution, or by governments that would restrict thought and communication» as «everyone can tell their stories to the world». 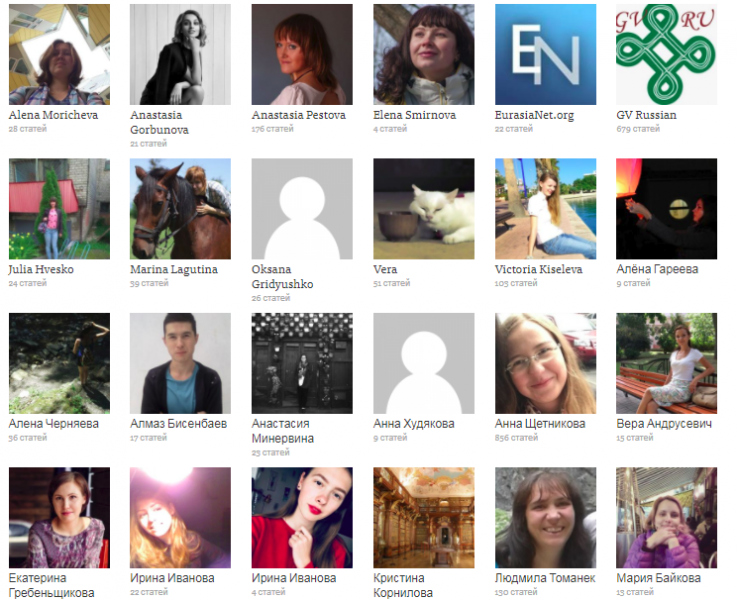 The small English-language project has since turned into a net of websites  published in 30 different languages — our volunteer translators work hard to make the stories told in English available for the netizens all over the world. In 2006, volunteers started translating GV articles into Chinese, and in 2008 the Russian-language team started its work. Our first translation  was of an article about the Rising Voices fellowship for media covering the issues of healthcare for marginalized communities, while the second  one highlighted the reaction of the Russian-language bloggers to the news that the Russian government had officialy recognized independence of Abkhazia and South Ossetia. During the last 10 years, following the development of our team, the scope of our interests has been constantly evolving: in 2010 almost all of our reports were related to Russia , but they gradually became more and more diverse, and in 2018 the most covered by our team countries are Iran  and China . Politics  has always been the most popular among our themes, while the topic occupying the second position is always different: it were the issues of digital activism  in 2011, protests  in 2012, and human rights  from 2013 onwards. The third most popular topic of our articles at this time is the freedom of speech . But the mere statistics is inadequate to re-tell even a small part of the stories we have translated for the Russian-speaking audience: from the Bahrain protests  of 2011 to the human side of the migrant crisis , from the threates faced by bloggers in Bangladesh  to the Syrian civil war . All this have been made possible thanks to our team  of volunteer translators who are generous enough to invest their free time in the development of the project. Presently our team is comprised of 31 active translators, while in the course of the last 10 years more than 200 people have contributed their time translating nearly 5,500 articles.